Royalty from all over the world have many things in common, one of which is having impeccable taste in holiday destinations — explore just a few of their favourite spots best seen by superyacht. 1. Ibiza One of the most famous Mediterranean party destinations to visit in summer, Ibiza is the idyllic spot to spend all day relaxing on pristine beaches and all night dancing with friends and family alike. Despite the slightly raucous reputation, the island is also well known for its array of luxurious hotels, astounding natural beauty and wealth of activities, which include hiking, sailing, wandering the cobbled streets of the Dalt Vila, cycling and checking out the local markets. This month (July 2017), Princess Anne's daughter Zara Tindall was spotted on vacation in the Spanish island with her husband, rugby star Mike Tindall. The two were enjoying drinks at the Cala Bassa Beach Club. In recent years, this stunning island has welcomed the likes of Princess Eugenie and her sister Beatrice, who was spotted on Roman Abramovich's superyacht Eclipse in 2015. Prince Harry also visited Ibiza in 2013, and Prince William partied with Kate Middleton in a private villa in 2006 for a week — they were pictured out on a day trip on board a small yacht called Tapeka Point. Superyachts up to 185 metres can moor at the new Sovren Ibiza Marina. Royalty from all over the world have many things in common, one of which is having impeccable taste in holiday destinations — explore just a few of their favourite spots best seen by superyacht. One of the most famous Mediterranean party destinations to visit in summer, Ibiza is the idyllic spot to spend all day relaxing on pristine beaches and all night dancing with friends and family alike. Despite the slightly raucous reputation, the island is also well known for its array of luxurious hotels, astounding natural beauty and wealth of activities, which include hiking, sailing, wandering the cobbled streets of the Dalt Vila, cycling and checking out the local markets. This month (July 2017), Princess Anne's daughter Zara Tindall was spotted on vacation in the Spanish island with her husband, rugby star Mike Tindall. The two were enjoying drinks at the Cala Bassa Beach Club. In recent years, this stunning island has welcomed the likes of Princess Eugenie and her sister Beatrice, who was spotted on Roman Abramovich's superyacht Eclipse in 2015. Prince Harry also visited Ibiza in 2013, and Prince William partied with Kate Middleton in a private villa in 2006 for a week — they were pictured out on a day trip on board a small yacht called Tapeka Point. Superyachts up to 185 metres can moor at the new Sovren Ibiza Marina. Perfect for those after some once-in-a-lifetime sights, Norway is a popular alternative to the usual winter destinations. Rugged, beautiful and otherworldly, the fjords are best explored by boat — it's not hard to see why a vacation cruising from Bodø to Tromsø in Northern Norway is a must. There are a number of charter yachts available to explore this extraordinary country, such as 48 metre Elsa _(formerly known as _Grace) _and 42.67 metre _Daydream. Earlier this year, Prince Harry took his actress girlfriend Meghan Markle to the town of Tromsø in order to witness the famous Northern Lights. It has been rumoured that they stayed in the luxurious Tromvik Lodge, spending time on the nearby lake as well as whale watching. Additionally, Queen Elizabeth II has also travelled to Norway a number of times, in 1955, 1981 and 2001 on state visits. Skattora Marina in the city of Tromsø can berth vessels up to 25 metres, therefore superyachts will have to drop anchor further out and tender to shore. Perfect for those after some once-in-a-lifetime sights, Norway is a popular alternative to the usual winter destinations. Rugged, beautiful and otherworldly, the fjords are best explored by boat — it's not hard to see why a vacation cruising from Bodø to Tromsø in Northern Norway is a must. There are a number of charter yachts available to explore this extraordinary country, such as 48 metre Elsa _(formerly known as _Grace) _and 42.67 metre _Daydream. Earlier this year, Prince Harry took his actress girlfriend Meghan Markle to the town of Tromsø in order to witness the famous Northern Lights. It has been rumoured that they stayed in the luxurious Tromvik Lodge, spending time on the nearby lake as well as whale watching. Additionally, Queen Elizabeth II has also travelled to Norway a number of times, in 1955, 1981 and 2001 on state visits. Skattora Marina in the city of Tromsø can berth vessels up to 25 metres, therefore superyachts will have to drop anchor further out and tender to shore. Mustique has always been a place of old-school glamour and long-standing holiday destination for the British royal family — the small Caribbean island was regularly visited by Princess Margaret in her heydey. In more recent years, the island has been frequented by the likes of the Duke and Duchess of Cambridge and the Middleton family, who took Prince George there on his first holiday abroad. According to various reports, the couple have been spotted in the bar of The Cotton House Hotel and they’ve stayed at the Aurora House on previous vacations. It’s been said that the pair enjoy scuba diving, horseback riding and playing tennis when not relaxing on the beach in Mustique. Yachts up to 24 metres can moor up in Britannia Bay, while larger yachts can drop anchor further out. Mustique has always been a place of old-school glamour and long-standing holiday destination for the British royal family — the small Caribbean island was regularly visited by Princess Margaret in her heydey. In more recent years, the island has been frequented by the likes of the Duke and Duchess of Cambridge and the Middleton family, who took Prince George there on his first holiday abroad. According to various reports, the couple have been spotted in the bar of The Cotton House Hotel and they’ve stayed at the Aurora House on previous vacations. It’s been said that the pair enjoy scuba diving, horseback riding and playing tennis when not relaxing on the beach in Mustique. Yachts up to 24 metres can moor up in Britannia Bay, while larger yachts can drop anchor further out. The Spanish royal family has spent many vacations in Mallorca, where they have two palaces. King Felipe and Queen Letizia stay with their daughters at their private summer residence in the Marvient Palace on the outskirts of Palma, where they spend time relaxing on the beach or exploring the capital. The Spanish Royal Family once owned a 41.4 metre private yacht called Fortuna, which played host to the Prince of Wales and Princess Diana in 1988 and 1990, on the latter of which they were joined by their sons Princes Harry and William. There are a number of mooring options for superyachts in Palma — Club de Mar hosts the largest yachts, offering berths for superyachts up to 125 metres. The Spanish royal family has spent many vacations in Mallorca, where they have two palaces. King Felipe and Queen Letizia stay with their daughters at their private summer residence in the Marvient Palace on the outskirts of Palma, where they spend time relaxing on the beach or exploring the capital. The Spanish Royal Family once owned a 41.4 metre private yacht called Fortuna, which played host to the Prince of Wales and Princess Diana in 1988 and 1990, on the latter of which they were joined by their sons Princes Harry and William. There are a number of mooring options for superyachts in Palma — Club de Mar hosts the largest yachts, offering berths for superyachts up to 125 metres. A number of Royals have been spotted in the prolific town of St Tropez, including Princess Diana, Princess Madeleine of Sweden with her husband Chris O’Neill, Princesses Beatrice and Eugenie, Sarah Ferguson and the Swedish Prince Carl Philipe with his wife Sofia Hellqvist. Princess Beatrice has been spotted at the famous Club 55 on Pampelonne beach in recent years, as well as on a number of different yachts. The Port de Saint-Tropez can berth superyachts up to 100 metres, though the nearby Port de Plaisance has berths for luxury yachts up to 50 metres — this beautiful part of the French Riviera is a must for anyone cruising along the Mediterranean coast. A number of Royals have been spotted in the prolific town of St Tropez, including Princess Diana, Princess Madeleine of Sweden with her husband Chris O’Neill, Princesses Beatrice and Eugenie, Sarah Ferguson and the Swedish Prince Carl Philipe with his wife Sofia Hellqvist. Princess Beatrice has been spotted at the famous Club 55 on Pampelonne beach in recent years, as well as on a number of different yachts. The Port de Saint-Tropez can berth superyachts up to 100 metres, though the nearby Port de Plaisance has berths for luxury yachts up to 50 metres — this beautiful part of the French Riviera is a must for anyone cruising along the Mediterranean coast. The Queen of England famously spends her holidays at Balmoral Castle in Aberdeenshire with her husband Prince Phillip and often other members of her family, but there are some strong royal ties with Scotland. The Duke and Duchess of Cambridge met at St Andrews University, while Pippa Middleton is engaged to the son of a Scottish Laird. The Royal pursuits at Balmoral include long walks in the grounds, picnics, horseback riding, shooting, long drives, movie nights, barbeques and board games. Additionally, Queen Margrethe of Denmark and her husband Prince Consort Henrik ventured to Scotland on a superyacht, visiting the Shetland Islands after a trip to the Faroe Islands. Though the number of superyachts that have ventured to Scotland has been far and few between, 82.6 metre Eos, 162.5 metre Eclipse and 55.2 metre Galileo G have both been spotted in Greenock in recent years. Moor up and take a private helicopter to explore the wild countryside of Aberdeenshire. 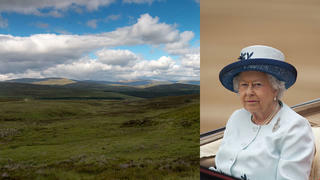 The Queen of England famously spends her holidays at Balmoral Castle in Aberdeenshire with her husband Prince Phillip and often other members of her family, but there are some strong royal ties with Scotland. The Duke and Duchess of Cambridge met at St Andrews University, while Pippa Middleton is engaged to the son of a Scottish Laird. The Royal pursuits at Balmoral include long walks in the grounds, picnics, horseback riding, shooting, long drives, movie nights, barbeques and board games. Additionally, Queen Margrethe of Denmark and her husband Prince Consort Henrik ventured to Scotland on a superyacht, visiting the Shetland Islands after a trip to the Faroe Islands. Though the number of superyachts that have ventured to Scotland has been far and few between, 82.6 metre Eos, 162.5 metre Eclipse and 55.2 metre Galileo G have both been spotted in Greenock in recent years. Moor up and take a private helicopter to explore the wild countryside of Aberdeenshire. A favourite of the rich and famous, St Barts is also a favourite spot for Princess Beatrice, who spent New Year’s Day there in 2015, and the Duchess of Cambridge, who has stayed at Eden Rock with her family. 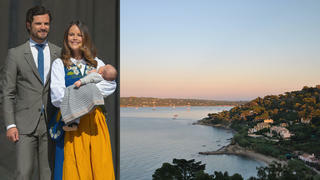 Last year, James and Pippa Middleton were also spotted celebrating the New Year on the island. Gustavia Port can accommodate superyachts up to 61 metres, otherwise there are a number of anchorages for larger yachts further out from the marina, where some of the best superyachts have been spotted this season. 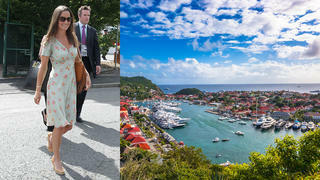 A favourite of the rich and famous, St Barts is also a favourite spot for Princess Beatrice, who spent New Year’s Day there in 2015, and the Duchess of Cambridge, who has stayed at Eden Rock with her family. Last year, James and Pippa Middleton were also spotted celebrating the New Year on the island. Gustavia Port can accommodate superyachts up to 61 metres, otherwise there are a number of anchorages for larger yachts further out from the marina, where some of the best superyachts have been spotted this season. Historically, Marbella has been a hub for regal escapades — specifically the Marbella Club Hotel, which was a popular spot for the Spanish Royal Family in the 1940s and 1950s, but also played host to English aristocracy and the ex-king Umberto of Italy. Over the years raucous and lavish parties would be held in the hotel’s famous Champagne Room, one of the best bars in the Mediterranean. Additionally, the Royal Family of Saudi Arabia have a strong connection in Marbella, as the King Salman Bin Abdulaziz owns a vast palace in the area. Superyachts up to 50 metres can moor up in Puerto Banús, while larger vessels can drop anchor a little further out. Historically, Marbella has been a hub for regal escapades — specifically the Marbella Club Hotel, which was a popular spot for the Spanish Royal Family in the 1940s and 1950s, but also played host to English aristocracy and the ex-king Umberto of Italy. Over the years raucous and lavish parties would be held in the hotel’s famous Champagne Room, one of the best bars in the Mediterranean. Additionally, the Royal Family of Saudi Arabia have a strong connection in Marbella, as the King Salman Bin Abdulaziz owns a vast palace in the area. Superyachts up to 50 metres can moor up in Puerto Banús, while larger vessels can drop anchor a little further out.